This article is about the student fraternity of the United States. For the student fraternity of the Philippines, see Kappa Sigma (Philippines). Kappa Sigma (ΚΣ), commonly nicknamed Kappa Sig or K-Sig, is an American collegiate social fraternity founded at the University of Virginia in 1869. Kappa Sigma is one of the largest international fraternites with currently 316 active chapters and colonies in North America. In 2012, the Fraternity “pledged more men than any other fraternity in history.” It is one of the leaders of all American fraternities in terms of pledges and new initiates per year, service hours, and philanthropic donations. Its endowment fund, founded in 1919 is the oldest college fraternity foundation and has donated more than $6.5 million to undergrads since 1948. In 2012 alone, the Fraternity’s endowment fund raised over $1 million in donations. 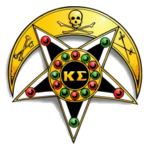 According to the traditions of the fraternity, Kappa Sigma evolved from an ancient order, known in some accounts as “Kirjath Sepher”, said to have been founded between 1395 and 1400 at the University of Bologna. The story says that the corrupt governor of the city, one-time pirate and later papal usurper Baldassare Cossa, took advantage of the students at Bologna, one ofEurope’s preeminent universities which attracted students from all over the continent, by sending his men to assault and rob them; this motivated one of the university’s scholars Manuel Chrysoloras to found a secret society of students beginning with five of his most devoted disciples, for mutual protection against Baldassare Cossa. In 1873, Kappa Sigma expanded to Trinity College (Now Duke University), the University of Maryland, and Washington and Lee University. The fraternity attributes this growth to the initiation of Stephen Alonzo Jackson in 1872. During his membership, Jackson expanded and revised the ritual of Kappa Sigma. He created the Supreme Executive Committee (SEC), which now serves as the governing body of the Kappa Sigma Fraternity on an international level. Jackson also introduced the idea of a frequent, national convention of all Kappa Sigmas, a practice now continued by the biennial Grand Conclave, and characterized the event as “the finest hour” of Kappa Sigma. In 1885, the publication of Kappa Sigma’s quarterly magazine was commissioned under the name The Quarterly This publication ran successfully for 5 years until it was reorganized to run bi-monthly and renamed The Caduceus, the name it holds to this day. In 2002, along with Phi Delta Theta, Kappa Sigma ended its involvement in theNorth-American Interfraternity Conference at the national level due to disenchantment with the strategic direction of the organization.However, many individual chapters remain members of their host university’s Interfraternity Conference, but no chapter is required to recognize or be involved with their university’s IFC if they should choose not to. In 2003, the Kappa Sigma Fraternity ushered in an unprecedented era of growth for the fraternity. Kappa Sigma would become the largest college fraternity. It also established incentives to expand Kappa Sigma, and worked to reestablish chapters where they were dormant and establish colonies in new locations. Kappa Sigma annually broke recruiting records from 2003-2012, setting the Guinness World Record with over 8,000 men pledged in the 2011-2012 academic year. In the Spring of 2005, Kappa Sigma Fraternity began fundraising for and construction of a new headquarters. This $6 million project had its grand opening on June 2, 2007. At the 66th Conclave, the Kappa Sigma Endowment Fund was declared to be the only official educational foundation of the fraternity. The Star and Crescent shall not be worn by every man, but only by him who is worthy to wear it. above all else, one who walks in the light of God. They also follow the four pillars of the Fraternity: Fellowship, Leadership, Scholarship, and Service. The Star and Crescent is also used as part of the guidelines behind Kappa Sigma’s strict no-tolerance anti-hazing policy. The Fraternity takes all allegations of hazing very seriously and routinely revokes charters from guilty chapters which can be as old as 130 years. To be eligible for membership a prospective member must profess a belief in God, though adherence to a specific religion is not required. In at least one situation, Kappa Sigma has revoked a chapter’s charter for omitting the fraternity’s religious requirements from its initiation. The Kappa Sigma Fraternity consists of over 300 chapters and colonies (probationary chapters). Each chapter is led by a five-member Executive Committee (EC), each referred to as an officer. These officers consist of the Grand Master (President), Grand Procurator (First Vice President), Grand Master of Ceremonies (Second Vice President), Grand Scribe (Secretary), and Grand Treasurer. Each chapter and colony also has a number of committee chairs that are assigned to specific areas (e.g. scholarship, sports, community service). Over 1,200 alumni volunteer as advisors for Kappa Sigma. At the international level, the Supreme Executive Council (SEC) sets policy for the fraternity, disciplines chapters, and approves the formation of colonies and chapter. The offices of the SEC mirror the office of the undergraduate EC and consist of the Worthy Grand Master (WGM), the Worthy Grand Procurator (WGP), the Worthy Grand Master of Ceremonies (WGMC), the Worthy Grand Scribe (WGS), and the Worthy Grand Treasurer (WGT). The WGM, WGP, and the WGMC each serve a two-year term, while the WGS and WGT each serve a four-year term with either the WGS or the WGT elected along with the other officers at the biennial Grand Conclave. There are over sixty districts covering America and Canada divided into five Areas. Typically, districts are composed of all the Kappa Sigma chapters and colonies within a State or Province, or a portion of a State or Province. Each district, composed of roughly 5 chapters each, are overseen by the District Grand Masters (DGM) and Assistant District Grand Masters (ADGM) who serve as liaisons between the undergraduate chapters and colonies and the SEC. An Alumnus Adviser (an AA) and several Assistant Alumnus Advisers (AAA), provide advice and assistance to each undergraduate chapter and colony. Along with the Alumnus Adviser, there are traditionally one Assistant Alumnus Adviser for each of the four EC positions other than Grand Master. That is, there are AAAs for the undergraduate offices of GP, GMC, GT, and GS respectively. There also exists several committees (each with a volunteer commissioner) under the SEC (e.g. ritual committee, business and finance committee, long-range planning committee). Each committee is made up strictly of volunteers and some contain various targeted subcommittees. The Undergraduate Advisory Committee (UAC), which is made of one undergraduate from each of the five areas, is charged with representing the their respective area as well as the general undergraduate perspective at all SEC meetings. The “model chapter room” at Kappa Sigma headquarters, pictured in 2007. There is a professional staff that manages the day-to-day operations the Fraternity at the international headquarters in Charlottesville, Virginia. This staff includes the Executive Director, Mitchell Wilson, as well as multiple program directors and administrative assistants. Also based out of international headquarters are the Area Recruitment Managers (ARM), who are in charge of recruitment goals and provide recruitment assistance to chapters in their respective geographic area. While most activities of the Kappa Sigma Fraternity occur at the undergraduate chapters, the Fraternity oversees four international programs or campaigns. The Greater Cause program is designed to record the activities and reinforce the concept that Kappa Sigma members should play an active role in their communities. Specifically, the program aims at raising $25 for and dedicating 25 hours per year towards charitable causes for each member. The program also aims at having 100% of the eligible chapter members registered to vote. Every chapter organizes its own charitable events, usually donating the proceeds to a local charity. Some of the bigger events that chapters organize are the “Catch-A-Dream Charity Classic Football Game” organized by the Delta-Chi Chapter at Mississippi State University, and the “Apple Cup Run,” jointly organized by the Beta-Psi Chapter at theUniversity of Washington and the Gamma-Mu Chapter at Washington State University. Or, the “Governor’s Cup Ball Run,” jointly organized by the Mu-Eta Chapter at the University of Louisville and the Beta-Nu Chapter at the University of Kentucky, who in 2010 will hold its 16th Annual Run. The Chi-Omega chapter at the University of South Carolina raises money annually for the Ray Tanner Foundation, which benefits economically and medically disadvantaged children in South Carolina, and the Columbia metropolitan area. The Kappa-Pi chapter at the University of Central Oklahoma hosts the Bath Tub push that benefits the Veterans’ Families United Foundation. During the 2012-2013 school year, Kappa Sigma donated a record $3 million and 1 million volunteer hours to charitable causes around the United States. Kappa Sigma’s Champion Quest Program is a “results-driven” recruitment initiative aimed at increasing the number of men added to the Kappa Sigma each year. Brothers in Action (BIA) is the “official membership development program of Kappa Sigma Fraternity” which seeks both individual and chapter development through goal setting and through emphasizing the four cornerstones of Kappa Sigma: Fellowship, Leadership, Scholarship and Service. The Brothers in Action program begins with the “BIA for Pledges program” and continues throughout your involvement with Kappa Sigma, including opportunities for personal growth and development at the various leadership conferences and conclaves. During the 66th Grand Conclave in 2007, the Fraternity announced a new charity entitled the “Kappa Sigma Fraternity Military Heroes Campaign”. The effort focuses service and donations towards soldiers disabled or killed in the line of duty. The Supreme Executive Committee determines how the contributions will be distributed to support these Patriots and Veterans. In recent years The American chapters raised money for the Fisher House Foundation whereas the Canadian Chapters raised money for either the Fisher House Foundation or one of the two other approved Canadian Armed Forces organizations and specifically The Valour Place. In 1919, the Kappa Sigma Endowment Fund was established “to support the charitable and beneficent purposes of the Kappa Sigma Fraternity”. The Endowment Fund’s first donors contributed $101 as the foundation for the fund’s assets. Currently, the Endowment Fund has two primary recognition levels for donors, the One of Jackson’s Men program – for donors who contributed $1000 or more to the Endowment Fund, and the Heritage Society for planned gift donors. The Endowment Fund assists with the educational and leadership programming at each Conclave and Leadership Conference. In addition, each year, the Endowment Fund awards $250,000 in scholarships to undergraduate members. These Scholarship and Leadership Awards are presented on Founders’ Day (December 10). To date, the Endowment Fund has contributed over $4.5 million in scholarships since 1948. Currently, the Endowment Fund, along with the Kappa Sigma Fraternity, holds in trust for the members of Kappa Sigma, the fraternity’s headquarters in Charlottesville, Virginia. The Endowment Fund sponsors leadership conferences each year held in conjunction with Kappa Sigma’s Biennial Conclave and Regional Leadership Conferences. In 2013, the 69th Biennial Grand Conclave was held in Las Vegas, Nevada. In 2015, the Kappa Sigma fraternity at Miami University ceased to be recognized by the national headquarters for forcing pledges to work out between 3:30 a.m. and 6 a.m. (causing exhaustion), cleaning fraternity member rooms, and buying them food. In 2015, two Kappa Sigma members from the University of West Virginia were arrested and charged with hazing and conspiracy for the death of Nolan Burch at an initiation ceremony. Burch died due to alcohol poisoning, his blood alcohol level was .493. At a Kappa Sigma fraternity house at Tulane University in 2013, police found over 20 grams of marijuana, 68.7 grams of psilocybin mushrooms, over 50 doses of LSD, .91 grams of DMT, 47.6 grams of opium and paraphernalia, and .75 grams of powdered cocaine. Two fraternity members were arrested and charge for possession of the drugs. In 2006, four Kappa Sigma members and an alumni member from the Winthrop University were arrested for detonating ice bombs in the backyard of their fraternity house. The fraternity was placed on social suspension by national leadership of the fraternity.